Filepicker recently interviewed Brandfolder Co-founder and Head of Product, Paul Arterburn, to discuss how he used Filepicker for GovDev Challenge hosted by Google. Why did you take part in GovDev Challenge? It was the first 24-hour GovDev Challenge put on by Google – who teamed up with the state of Colorado and Wyoming to come up with the different challenges we worked on. 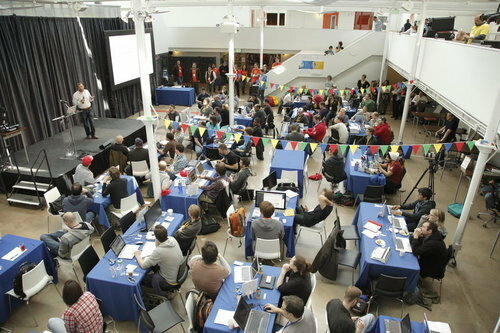 Approximately 120 developers showed up at the event put on at Galvanize in Denver because Google was handing out $19,500 in cash for the winners. How did you find Filepicker? Did you know of it before GovDev Challenge? We use Filepicker pretty heavily at Brandfolder to integrate Dropbox and Google Drive. Filepicker is by far the fastest way to do that. Its ability to upload to our app, along with its built-in UI, are the biggest benefits to Brandfolder. How did you benefit from using Filepicker for GovDev Challenge? We created an inventory management web app for disaster relief efforts. The app allows for scanning of UPC codes by simply taking a picture. For the GovDev hackathon, we used Filepicker to save files to the cloud that we served up from Filepicker.com. I built an API that utilizes UPC scanning, so we could take a picture, upload it through Filepicker, then convert that picture through a UPC decoder and match it up in a UPC database. In about 3 minutes, we were able to integrate Filepicker and get to the point where we could upload files to the web. It was pretty cool, because we placed third within a room full of devs who had been working together on their own teams. Our team came in without knowing each other. We were happy to help the state government with disaster relief with our app.